What do Hillary Clinton, James Joyce, and Michael Jackson have in common? For one thing, they’re all memorialized in the post-Communist world. A search through the Post-Communist Monuments Project’s database illustrates the prevalence and content of monuments to foreigners in this space. In this article, I’ll discuss the distribution of nationalities of the figures memorialized as well as the contexts for their memorialization. Finally, I will explore the social significance of a recent spate of monuments to foreign celebrities. I focused my analysis on the memorialization of nationals not of the Communist/post-Communist states in order to identify patterns in their commemoration. In total, only a small percentage of entries in the post-Communist monuments database concerned monuments dedicated to foreigners; the figure stands at 4.17 percent, or 82 out of 2036 “newsworthy” monuments between 1984 and 2009. Generally, I did not include monuments to nationals of neighbouring Communist states (for example, a monument to Lenin in Ukraine) in this statistic. The number may seem low, however considering the fact that only 2.5 percent of the database’s entries go to women, it’s a significant figure. What country’s nationals are most represented in these monuments? There was plenty of overlap of media coverage on the same monument, so it doesn’t stand to quantify the entries. However, the number of monuments as a percentage of all monuments to foreigners is distributed as following: French (8 %), British (10%), American (24%), Japanese (16%), Swede (10%), Austrian (2%), Irish (4%), French (4%), Danish (2 %), Norwegian (2 %), West German (4%), Turkish (4%), Italian (10%), Venezuelan (2%), and Spanish (2%). While these figures can’t represent the actual distribution of monuments in the post-Communist world by nationality, they can speak to a general trend favoring Americans and Western Europeans. As shown by the data, while it seems that a foreigner’s best bet to being memorialized in the post-Communist world is to be from the United States or Western Europe, there is no particular nationality that dominates the category. More conducive to likelihood of memorialization is the experience of that individual that warranted their memorialization-- in other words, the content of a life lends itself better to likelihood of memorialization than nationality does. Of these monuments to foreigners, most commemorate military and civilian casualties of war. Within this category, most of these people lost their lives during World War II (including the Holocaust), followed by World War I, and finally the Yugoslav Wars. Other tragedies include the September 11th Attacks and imprisonment in the GULAG system. The next most common subject type is occupied by political actors, including politicians, diplomats, and military generals. Finally, a minority of monuments to foreigners commemorate writers, musicians, and other artists. It seems that nationality does not have bearing on what type of actor is commemorated. For example, monuments to Americans were primarily memorials to military servicemen but included artists and politicians. Japanese honoured were just as likely to be civilians as servicemen; several monuments were erected to Japanese diplomat Chiune Sugihara, who saved an estimated 6,000 Jews from murder during Holocaust. Tied for third place are monuments to British, Swedish, and Italian nationals. There is no distinct “type” of subject among these nationalities either-- for example, just under half of Monuments to Italians focus commemoration on a military figure or the military past of a figure otherwise occupied. The remainder includes such varied subjects as the 1000 Italians who perished in the GULAG system and poet Dante Alighieri. As Izabela Steflja writes in “To History or Hollywood: Monuments to Foreign Celebrities in 21st Century Balkans”, “Popular memories and their expressions, including monuments, exist because a specific community believes that an object, individual, or space is significant enough that it should be passed onto the next generation.” Civilian and military casualties of war, indigenous or foreign, are easily defensible as being worthy of commemoration for future generations; An example of such a defense might be that a nation’s war dead command the same respect as is attributed to the nation. More difficult to rationalize-- and therefore perhaps more socially significant in their creation-- are monuments to foreign artists and celebrities. Examples such as the James Joyce statue in Ljubljana and the Sylvester Stallone statue in Žitište, Serbia raise questions as to what leads to the commemoration of a figure, particularly when they are not tied to the geographic location of the monument. Steflja’s article treats the “spate of monuments” to western celebrities in the former Yugoslavia as a unique phenomenon and the result of “turning toward the outside”, or perhaps even a reflection of the idea to “think globally, act locally.” Critically, Steflja argues that in the Balkans, these have been civil-society led movements to memorialize these figures. Reception, however, has not been overwhelmingly positive: Steflja cites an artist’s criticism that through these monuments, “history is being replaced by Mickey Mouse.” Previously discussed data suggest that this is not the case, but rather that “legitimate” history is still very much the main focus of monuments to non-indigenous entities in the post-Communist world. To conclude, while monuments to foreigners in the post-Communist world are a minority, their prevalence in the collection of “newsworthy” monuments suggests they are relatively common. While there is no one nationality that dominates the grouping, Americans and Western Europeans are the focus of most of these monuments. The monuments are most likely to commemorate victims of the World Wars and the Holocaust, but political figures feature prominently as well. Finally, as discussed by Izabela Steflja, more recently constructed monuments to foreigners, unable to be attributed as war memorials, are likely reflective of an ideological shift towards openness and global citizenship, as exemplified in the Western Balkans. Yekaterina Sinelschikova (2018) From Marx to Michael Jackson: Which Foreigners Are Honored with a Statue in Russia?" Russia Beyond. January 02, 2018.. https://www.rbth.com/arts/327205-foreigners-monuments-in-russia. They were built in the 60s and 70s. They were later deemed “abandoned.” Yet for something so allegedly antiquated, people cannot seem to forget them. The enduring memory of the Spomeniks is not unbefitting, for their name describes just that: the monuments. Commissioned by Josep Broz Tito in the wake of the Second World War, the series of behemoth structures designed by various sculptors and architects (Miodrag Živković, Dušan Džamonja, Gradimir Medaković, Bogdan Bogdanović et al.) were built to commemorate the lives of soldiers lost in combat. Each monument, evasive of flouting for whom it stands, is positioned on battlegrounds across the former Yugoslavia. Following the victory against German occupation, the Spomenik served as a unifier to a new confederation. But after the brutal disbanding of Yugoslavia, the concrete alien configurations became ghostly reminders of a failed socialist regime. Having lost their salience in their home countries, the monuments went into a slumber until 2010 when Belgian photographer Jan Kempenaers resurrected them into the international spotlight. Since then, the Yugoslavian monuments have transcended national boundaries and have drawn the attention of artists and scholars alike. Perhaps most striking is artist Aleksandra Domanović’s appropriation of the spomenik. For the 4th Marrakech Biennale in 2012, Domanović recreated one of the fist monuments from Bubanj Memorial Park in Niš (Serbia), designed by Croatian sculptor Ivan Sabolić in 1963. But the structure is far from a carbon copy. Her version is 6 meters tall, made of wood, and gleaming with bright pink tadelakt—a traditional Moroccan finishing process. Domanović left spectators with a strangely recontextualized monument, melding signifiers of Yugoslavian socialism with a Moroccan environment. In 2014, the spomeniks were showcased in a video by Croatian artist Igor Grubic at the ‘Concrete’ exhibition at the Monash University Museum of Art (MUMA) in Melbourne (Australia). His work explores memorials as well as historical erasure. Amsterdam-based Serbian artist Kristina Benjocki’s ongoing multimedia project, ‘Past, Less Predictable Than the Future’ explores politics and memory through the Yugoslavian memorials as well. 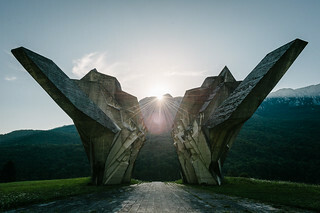 Vladimir Kulić—assistant professor of architectural history and theory at Florida Atlantic University—has received a grant from the Graham Foundation to examine the works of Serbian-Yugoslav architect Bogdan Bogdanović—whose work includes the Jasenovac Memorial Complex, in Jasenovac, Croatia. This April, the Baltic Centre for Contemporary Art, Newcastle (UK) is holding a seminar on socialist Yugoslavia’s modernist architecture. To say that Tito’s monuments have been forgotten could not be further from the truth. Yasmin Nurming-Por. “Speaking of Time: The Ethics and Aesthetics of Framing Yugoslavia’s Spomenik Post ’89.” Drain Magazine 11, no. 2 (2014). Accessed April 15, 2015. http://drainmag.com/speaking-of-time-the-ethics-and-aesthetics-of-cultural-mortality-the-politics-of-framing-yugoslavias-spomenik-post-89/. Chan, Carson. ‘The Avery Review | Partial Recall: A Brief Account Of Aleksandra Domanović’s Monuments And The Aesthetics Of The Near Obsolete.’ Averyreview.com. N.p., 2015. Accessed April 1, 2015. Dan Rule. “Concrete Exhibition Explores Monumental Themes.” The Sydney Morning Herald, May 6, 2014. Accessed April 15, 2015. http://www.smh.com.au/entertainment/art-and-design/concrete-exhibition-explores-monumental-themes-20140506-zr5f0.html#ixzz3Wqq3BF5P. Vladimir Culić. “Architecture’s Expanded Field: Bogdan Bogdonović and the Alternative Genealogy of Postmodernism.” Graham Foundation. Accessed April 15, 2015. http://www.grahamfoundation.org/grantees/5159-architecture-s-expanded-field-bogdan-bogdanovic-and-an-alternative-genealogy-of-postmodernism. 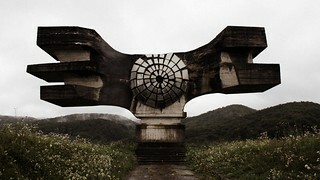 The Guardian has a feature on Spomeniks today: the strange and impressive WWII monuments that dot the former Yugoslavia. To read the article and see the images, click here. Photographer Jan Kempenaers has an exhibition featuring this work at UCLA this spring/summer; click here for information.